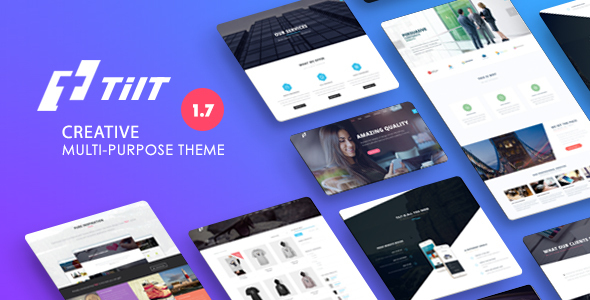 Tilt is a powerful multipurpose theme suitable for corporate and personal business homepages, creative portfolio showoffs, blogs, e-commerce and product & service presentations. Read more about the rich features that Tilt offers below. … this is to name some – see them all and many other in the theme preview! The images included in preview are for demonstration purposes only. They are replaced with placeholder images in the theme demo data. We would appreciate if you use our Support Forum in case you need any help working with the theme or have suggestions on how to improve it. Let’s learn and develop together! Special thanks go to everyone who helps us persistently develop this amazing theme by reporting bugs and issues, as well as sharing new ideas on future improvements! - Improvement: Service shortcode now allows to choose html tag for title. - Fixed: onepage navigation bug when menu contained identical hashes belonging to different pages. - Improved hash navigation, now allowing both in-page and cross-page navigation with support of Back and Forward browser navigation.